Betterment enjoys name recognition in the robo-advising space. This means if you want a company that’s modern, easy to use, and widely known, this might be the robo-advisor for you. There’s no minimum investment, but you will pay a management fee of 0.25% with any balance up to $100,000. The company also offers tax-loss harvesting and a large variety of account types. If you have $100,000 or more, you can enjoy the services of certified financial planners (CFP). The human element is not something you’ll find with the majority of robo-advisors (since the whole point is investing without traditional human advisors to keep the costs low), but if you have enough money to enjoy the best of both worlds, the company's premium service might be perfect for you. Pricing: How Much Does Betterment Cost? Betterment prides itself on minimizing investor fees. The company doesn’t charge trade fees, transfer fees or rebalancing fees. Its annual fees vary depending on the level of service you want and the minimum balance you have to invest. The “Digital” level has no minimum balance necessary and charges an annual fee of 0.25%. The “Premium” level requires a minimum balance of $100,000 and charges an annual fee of 0.40%. It comes with the robo-advisory features of the “Digital” plan, plus unlimited calls with a CFP®. The fees you owe will be taken out of your account. You won’t need to mail a check or make an online payment. If you don’t have a balance in your account, you won't be charged a fee. There is no fee for having a $0 balance. You can cancel your account at any time. If you cancel, your fees will be prorated. That means that if you leave before the end of a month you’ll only pay fees for the part of the month that you had an investment balance. In addition to an annual fee, you’ll pay the fees associated with company's investment funds. However, the company says it seeks to structure its ETF funds to minimize fees. The company follows modern portfolio strategy, which emphasizes maximal diversification across a broad asset class. To achieve this in its offerings, Betterment uses a portfolio entirely made of exchange-traded funds (ETFs). The reasoning is that ETFs are low cost and have a high liquidity. It tries to choose the lowest-fee ETFs that offer the best performance. Your portfolio is selected based on what risk level and financial goals you indicate during the onboarding process. You can choose from goals, such as safety net, build wealth or retirement. For those who are less risk-tolerant, the company will add more bond ETFs which include short-term treasuries, municipal bonds, emerging market bonds and more. If you’re open to more risk, your portfolio will have stock ETFs include emerging market, international developed, U.S. mid-cap value stocks and more. Each portfolio has different allocations of ETF types depending on what financial goals you indicate. If you have a taxable account, your bond allocations will take advantage of tax-exempt municipal bonds. Retirement accounts, which are tax-advantaged, will have more investment-grade bonds. While Betterment is considered “passive investing,” each account type is optimized for tax advantages and other concerns. And if you want to learn more about how the company's portfolios perform compared to active investor portfolios, there's data available for potential customers to analyze. You can choose from a large variety of products, including traditional, SEP or Roth IRAs, 401(k)s, and joint and trust investing accounts. However, despite a robust product offering, the company doesn’t offer 529 college savings plans or custodial IRA accounts. Betterment offers what it calls Tax Loss Harvesting+™. Tax-loss harvesting is a term that refers to a portfolio management practice that minimize taxes. When an investor sells a security that has experienced a loss, he or she can then use that loss to offset, for tax purposes, the gains from another security or asset that has increased in value. After selling for a loss the investor can then re-purchase a similar security to the one that experienced a loss, keeping the portfolio in balance. If you choose to invest, Tax Loss Harvesting+™ will run throughout each day on your investments. The company’s technology will automatically crawl your investments, looking for losses that can be harvested to minimize tax liability. Tax Loss Harvesting+™ is available at no additional cost – you don’t have to pay extra to take advantage of the company’s tax-loss harvesting technology. In addition to Tax Loss Harvesting+™, the company offers what it calls “Smart Rebalancing.” This is automatic rebalancing that times your sales and purchases so that you don’t run the risk of buying high and selling low when you’re trying to rebalance your investments. The company's features are designed to keep you from making mistakes that can cost you money. They’ll flag times when you may be keeping too much money in cash that could be working harder for you if you invested it in the stock market. They’ll warn you against selling assets off after a market downturn. They’ll take the work out of tax-loss harvesting and rebalancing for you, so you don’t have to do it yourself (and so you don’t do it incorrectly). If you want help with your investing but don’t want to pay for a real-live financial advisor, this could be a good fit for you. Smart Saver is a low-risk investment account that Betterment offers as a higher-earning alternative to a savings account. It's goal is to help you earn a better return on cash that would otherwise just be sitting in your savings account or checking account. The money in your Smart Saver account is invested in 80% U.S. Treasury bonds and 20% low-volatility corporate bonds, and it's designed to earn a 2.23% annual yield. What sets the Smart Saver account apart is its built-in cash analysis tool for your linked checking account. Every day, the tool will analyze your checking account to see if there's excess money that you could be earning more from. If there is, Betterment will transfer the extra cash into your Smart Saver account. This is one half of it's Two-Way Sweep feature. If the tool sees that there isn't enough in your checking account to meet your monthly expenses, the other half kicks in and it will move money out of your Smart Saver account and back into your checking account. The Two-Way Sweep feature is designed to make sure you're getting the best bang for your buck at all times without you having to worry about moving money around. You can customize your settings to specify a dollar amount at which the tool will move money back into your checking account if you like. Betterment will also notify you before it makes any transfers, just in case you want to keep your money as it is. What kind of customer would benefit from this service? The “Betterment Digital” pricing plan is open to anyone, with no minimum investment required. But should an investor whose money is tight opt for this robo-advisor? That depends. Before you begin weighing which robo-advisor is right for you, be sure to think about whether a robo-advisor or a human advisor is best for you. If you have a more complex situation and more money to invest, a human advisor may be a better choice. SmartAsset's SmartAdvisor matching tool can help you find the right advisor for your needs. All you have to do is answer a series of questions about your investment goals and preferences, and then the program will pair you with suitable advisors near you. If you're leaning towards a robo-advisor and considering Betterment, be aware that the company’s investment products (ETFs), are also available through competitors, including Wealthfront and Vanguard. In fact, Betterment and Wealthfront put investors’ money into Vanguard ETFs. If you really wanted to save on fees you could skip the middle man and invest directly with Vanguard. On the other hand, Betterment’s automated Tax Loss Harvesting+™ and rebalancing take a lot of the work out of investing for you, so you may decide that these added services are with paying more in fees. In short, if you want low fees but you don’t want to do the DIY investing needed to get the absolute lowest fees, this could be a good choice for you. This robo-advisor is also a good choice for someone who tends to dread logging on to clunky websites to deal with financial admin. Why? The user interface is clean and clear. In addition, Betterment lets you sync outside accounts so you can keep an eye on other pots of money. This way you are looking at your full financial picture all in one place. The company can alert you to missed opportunities in your other accounts. These could be accounts that are subject to high fees, or “cash drag,” money that’s not earning much in the way of returns and is dragging down your portfolio performance. During the onboarding process, you’ll be guided through a series of questions about your financial goals. You’ll need to share details such as your age and income to help set a retirement savings target and other investing goals. The company will tell you a suggested asset mix based on your goals and targets. You can customize your asset allocation, however; you don’t have to follow the company's suggestions to the letter. One feature that sets this robo-advisor apart is its approach to the emergency fund/safety net. Like many other financial firms, it recommends that you keep three to six months of living expenses in a safety net. However, Betterment recommends that you invest that money rather than keeping it in a low-return money market fund or savings account. 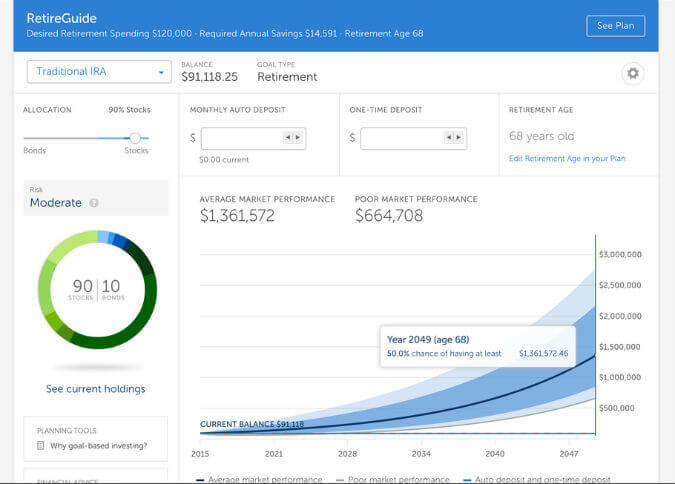 Once your account is set up you’ll be able to view your dashboard and check on your investments. You’ll also have access to the company's customer service. At tax time, you'll be provided with the relevant tax forms you need to fill out your return. Come February, your 1099 tax forms will be imported to your account. The company also integrates with tax preparation software like Turbo Tax. One of Betterment’s most attractive features, Tax Loss Harvesting+™, only benefits investors who open taxable accounts with the company. If you use the robo-advisor for a tax-deferred account like an IRA you won’t reap the benefits of the company’s Tax Loss Harvesting+™ technology. Finally, if you have less than $100,000 to put in your accounts you won’t have access to the company’s CFP® professionals. You won’t be able to get a financial tune-up or seek human advice on how to meet your financial goals. Competition: How Betterment Stacks Up? How does the robo-advisor compare to its competitors? We’ve mentioned that you could pay lower fees if you were willing to build and manage your own portfolio of Vanguard ETFs rather than having Betterment do the work for you. But comparing Betterment and Vanguard isn’t exactly an apples-to-apples comparison. Most people don’t have the time, desire or know-how to go totally DIY when it comes to investing. Even if they built their own ETF portfolio they might not be able to achieve the tax-optimized portfolio management that is one of Betterment’s biggest selling points. Betterment’s closest competitors may be Wealthfront and Wealthsimple. Wealthfront’s annual fee is the same as the annual fee for the Betterment Digital pricing plan: 0.25%. Wealthsimple Basic's annual fee, on the other hand, is much higher at 0.50%. However, Wealthsimple manages the first $5,000 for free; Betterment offers fee-free management for funds over $2 million. Wealthfront requires a minimum investment amount of $500, while Wealthsimple, like Betterment, requires no minimum investment. What Wealthfront doesn’t offer is the option to talk to a human. While Betterment allows clients to step up a higher pricing plan and get access to human financial experts, Wealthfront only offers robo-advising. Wealthsimple offers access to a human advisor through text, calls or email in its Basic option. If you upgrade to Wealthsimple Black, you'll gain access to financial planning sesions with human advisors. However, Wealthfront has an additional feature that both Betterment and Wealthsimple lack: Wealthfront offers 529s for college saving. One final difference that’s worth flagging is what’s called direct indexing. For balances over $100,000, both Wealthfront and Wealthsimple offer direct indexing. Betterment does not offer this service. Direct indexing is basically tax-loss harvesting on steroids. However, like regular tax-loss harvesting, direct indexing is only applicable to taxable accounts. If you plan to use either robo-advisor to open an IRA, you don’t need to consider the tax-loss harvesting offerings. Check out this chart to see how the fees compare. Bottom Line: Should You Use Betterment? Betterment has been growing rapidly since it launched – and with good reason. The company offers low fees for the services it provides. Its user experience and customer service are consistently well reviewed. Particularly if you have taxable accounts and don’t feel the need to take the DIY approach to investing, you could get a lot out of what this robo-advisor has to offer. First, figure out how much you’re able to invest. If you’re just starting out and don’t have much to invest, a robo-advisor like Betterment might be the right option for you. Robo-advisors typically have lower account minimums and fees. These are the top 10 robo-advisors. If you have more money to invest and a more complex financial situation, a traditional advisor might better suit your needs. 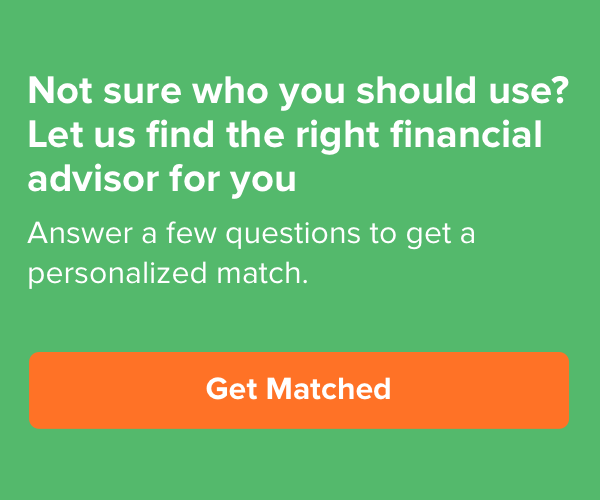 The SmartAdvisor financial advisor matching tool makes it easier to narrow down your choices. After you answer a series of questions about your preferences and financial goals, the program will pair you with up to three advisors near you. Once you’ve narrowed it down to a few financial advisors, research each of the advisors and interview them. You should be sure to ask about their fees, certifications and whether they have any disclosures. You should also explicitly ask them whether they abide by fiduciary duty.